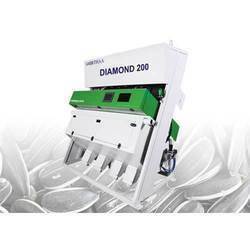 As an esteemed name in the relevant industry, we bring forth a distinguished assortment of Sunflower Seeds Sorting Machine. By following industry set standards, this sorting machine is manufactured by utilizing premium quality components and sophisticated technology. Used to separate sunflower seeds without any effort, offered sorting machine is available in various sizes, designs and specifications. Moreover, this sorting machine is highly appreciated in the market owing to its varied quality attributes. DIMENSION (L X W X H) IN" 71" X 54" X 71" 71" X 54" X 71" 71" X 54" X 71"
DIMENSION (L X W X H) IN" 85" X 54" X 71" 85" X 54" X 71" 102" X 54" X 71" 102" X 54" X 71"
Looking for Sunflower Seeds Sorting Machine ?